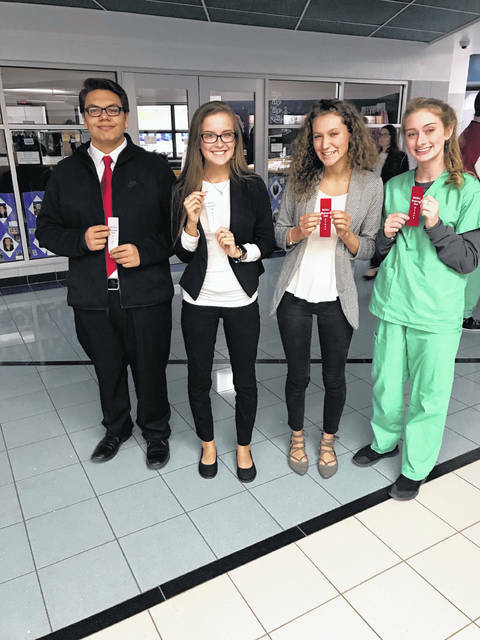 HOSA State qualifiers from the Allied Health and Nursing satellite program include, from left, Orlando Marcos, Bailie Clark, Peyton Preston and Kylie Allmon. Several students from Ohio Hi-Point’s Allied Health and Nursing programs advanced to the HOSA State Leadership Conference after competing at the regional level. Students competed in a variety of event categories, including Medical Law and Ethics, Medical Math, Human Growth and Development, Knowledge Bowl, Biomedical Debate Team, Nursing Assisting, and Pathophysiology and Physical Therapy. Ohio Hi-Point’s Allied Health and Nursing programs are located at the Bellefontaine Main Campus, Kenton Northwood, and Marysville Early College High School. Students competing from the Kenton satellite program participated in the Northwest Region, while the Bellefontaine Main Campus and Marysville satellite programs participated in the Central Southeast Region. The Allied Health and Nursing students are taught by Tammy Heitmeyer, Megan Elkins, Deb Purcell, and Stefanie Brown.